As can be seen from this pic, I have 3 durantium deposits mined by 1 and the same starbase. Yet, the math is obviously wrong: the screen itself says that 0.2 x 3 = 0.4! I got + 0.1 mining thanks to survivalism ideology multiplier, selective culling, that gives such bonus. To my understanding, it gives that 0.1 to only the very first resource that is mined by the starbase, ignoring that I have 3 of the same resources mined by that starbase. 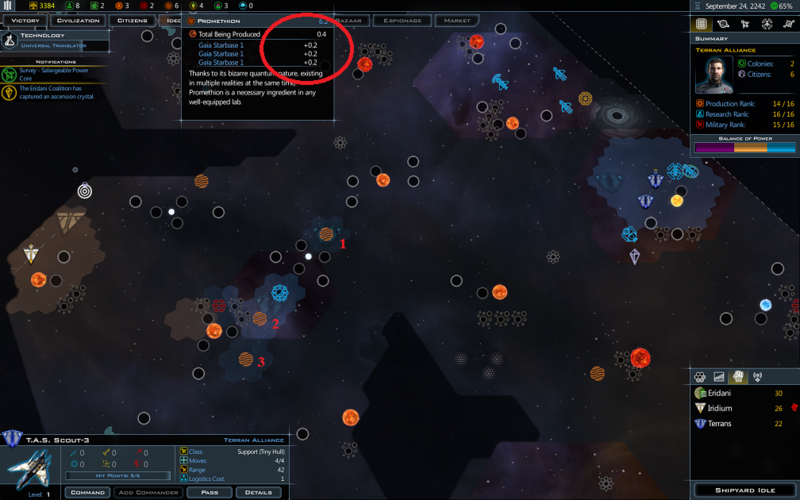 Is just the display wrong or is it not generating the resources? Are you playing with any mods? Yes. Its gauntlets race mod. No other mods currently present. So what? Since the bug is tied a trait specific to the mod, I would suggest reporting the bug to the mod's author. Its Gauntlets RACE mod, not his ideology mod, that is no longer available. So how exactly the bug is related to his mod? I just looked in the Ideology trees, only the Pragmatic Builder IV, Resourceful, gives a bonus to mining. I tested it and it works for me. I don't know what is and isn't in each mod You mentioned a "survivalist" ideology reward which I believed was a part of the mod. Just a misunderstanding on my part. I wrote to Gauntlet already, but he has not responded yet. Hi there. I'll be looking into it for the next update of GRM and such. That being said, before posting and asking for help from our lovely community, you should ALWAYS identify if you are using mods. Since you know you are using GRM, if you want a quicker reply, I suggest posting in the GRM thread. Thanks for reporting, if you want to try and fix it yourself, I suggest opening the ideology ability file and copying the entry from pragmatism, which is what I did originally... likely something in the original file got updated and I missed the change. Actually I discovered the bug. but it seems the interface can't display that properly and is rounding to a .1 bonus... but I believe the math is working mostly correctly. Those ".2" are most likely really .15... and adding to .45 (3 sources at .15 each) but only displaying .4 (because again, it can't display the additional decimal). I guess i could change Selective Culling to .1 to make this go away, but I'll need to make it weaker in other regards as a result.